I fell a little behind in reviews after taking a couple of summer vacations, so here’s some short thoughts on the movies I saw in July and also: in about a week, I’ll be putting out a rental revisit with four movies in it instead of two, including: The Zookeeper’s Wife, A Cure for Wellness, The Promise, and Gifted. Christopher Nolan is probably my favorite filmmaker, because he represents what’s still so great about the movie industry. He’s among the only directors who fuse high-concept art projects with blockbuster entertainment in a way that makes every one of his movies accessible to everyone, but also mollifies the more snobbish nature of experienced film-goers. He shows us the exact reason why seeing movies in the theater is still important, both with big productions and big ideas. Dunkirk is a bit of a step back for Nolan. By that, I don’t mean a step back in quality, but rather a step back in terms of length and scale. The movie is about 100 minutes and is very selective in the amount of war-action to give the audience. This is not a movie about a huge battle, and it’s not going to be as brutal as Hacksaw Ridge or Saving Private Ryan. It’s instead a story about a concession of defeat and an evacuation that is more about the outside opinions of war than it is about winning the battle. It would’ve been easy for Nolan to clock in another 3-hour movie about the battle, but he tells this story a bit differently than his last few projects. There’s less schmaltz, and there’s way less down time. By the time you figure out where this movie is taking you, you’re already there. There’s no respite in this film. The tale of the civilian-aided evacuation of Dunkirk is pretty famous in the UK, but has not gotten as much attention here, because it occurred before the United States joined WWII. After losing a recent battle against the Germans, the British ordered an evacuation of as many men off of the beach as possible, which seemed hopeless with the Nazi forces closing in with a clear perimeter around the location. Although disorganized, the navy had civilian/private boats drive across the English channel to participate in the evacuation, hoping to save around 30,000 soldiers for the battles to come, knowing the remainder would likely be killed. Instead, with civilian help, they ended up evacuating 300,000 troops, ten times the amount they had estimated. The story of this evacuation is told in three parts: first, a birds-eye view of the soldier’s experience (through the eyes of newcomer Fionn Whitehead) taking place over a week, second, a civilian boat (driven by Mark Rylance) attempting to cross the channel and evacuate soldiers over the course of one day, and third, a group of British pilots (led by Tom Hardy) attempting to protect the evacuation and shoot down any German planes that have come to bomb the evacuation boats over the course of one hour. These three timelines are given a non-linear focus, but have about the same in actual movie time. The three stories swell into a large conclusion when the timelines merge. If you’re a fan of Nolan, you know that he likes to use as many real props and devices as possible, limiting CG to only the necessities. This movie did a lot of that, using boats and disguising them like they were from the 40s, using real planes that looked the part, etc. When the movie’s sound design occasionally feels a bit heavy, you realize that the planes sound louder than you’re used to because he actually tried to get planes that looked and sounded as accurate as possible. There’s a story online of a soldier that survived this ordeal talking about how real this movie felt to him, like he was back on the beach. No matter what big studios want you to believe, computer imagery will never feel entirely as natural as real explosions, real vehicles, and real devices. Nolan’s movies are always considered gorgeous because he does his best to make them as tangible as possible. Now, that’s not to say that the cinematography isn’t gorgeous. It is, and the movie looks fantastic from start to finish. The editing, sound design, and cinematography are completely indicative of a director at the top of his craft. If a shot looks a certain way or sounds a certain way, it’s because that’s what Nolan wanted. In addition, Hans Zimmer completely nails the score, almost seemingly incorporating the score into the production design. The film itself has very little dialogue, mostly revolving its plot points around the imagery, so the score adds to the story that’s being told in a way that allows Zimmer’s powerful music to move to the forefront. If there’s one complaint about Zimmer, it’s that he’s occasionally overzealous in his score, and here, because there’s no dialogue to overpower, his tendency to overcompensate actually makes the movie better. We also get the ticking clocks constantly to remind us about the eventual fusion of these three timelines. The performances are all decent, and I was especially happy with Fionn Whitehead as the newcomer, but also with Harry Styles as well. Older actors lend plenty of support, allowing Mark Rylance to really be the emotional core of this movie (we learn more about him than anyone, arguably), and Tom Hardy gives a lot of expression just in his eyes while in the cockpit of his plane. I got some Bane flashbacks with the crazy eyes, just slightly. Truly, I can’t find much wrong with Dunkirk, other than that the blending of the plotlines isn’t always entirely seamless. It has its issues in pacing just as any movie can, but there are a couple of confusing parts that don’t really get aided by a second viewing. I will happily say that a second viewing does help, but there’s some slight muddy execution in the timelines. Other than that, this is a great film, and shows Nolan again at the top of his craft. One of the most underrated and understated franchises during this movie era of constant sequels, a product of safe investing from film distributors, is this motion-capture reboot of the Apes series. After a surprisingly good debut in 2011 with Rise of the Planet of the Apes, we got a near masterpiece in one of the best films of 2014 with Dawn of the Planet of the Apes. Now, we get War for the Planet of the Apes, a combination of a last ditch effort to save humanity and a continuation of the infighting and personnel conflicts within the rising ape society from Dawn. We pick up around a year or two after the events of Dawn, with Caesar (Andy Serkis) still feeling the after-effects of that coup led by the ruthless Koba (Toby Kebbell) in the previous film. The ape society is still developing, and their battle with the humans has gotten worse now that the U.S. military no longer exists, replaced by a faction of ape-hating rebels who are involved in a violent last-ditch effort to save humanity. The simean flu (which doesn’t kill humans but rather saps their communicative ability, taking their ability to speak and reason) has spread to nearly everyone, and the group executes anyone who they think has contracted it. These rebels are led by the Colonel (Woody Harrelson), who sends a message to Caesar by sneaking into his camp and murdering his wife (Judy Greer) and eldest son Bright Eyes (Max Lloyd-Jones). Guided more by pain and hatred instead of competent leadership, Caesar walks away, leading a small group of apes in a saboteur attack against the Colonel, including Maurice (Karin Konoval), and Rocket (Terry Notary). He sends the rest of the apes on a trek East, to attempt to get away from the human presence in California where they’re located. While the apes relocate and try to avoid detection, Caesar is plotting his revenge. One of the film’s mistakes is hard to explain, but I think is due to the reliance on the audience’s ability to remember the minutia about these individual ape characters who are not Caesar. In the first act, there are a lot of ape names and characteristics name-dropped by Caesar in his various scenes of planning, and I don’t feel a connection to any of the ape characters who aren’t Caesar and maybe Maurice. The film attempts to amp up the drama between the characters, but the films have been so Caesar-heavy, that when we are expected to understand a personality trait of someone like Lake (Sara Canning), it feels unearned. A lot of the first act felt a bit like watching a current episode of a television show after skipping the last season. I just felt behind and didn’t react as well to the drama because I don’t really know much about any of the other characters. So, although we get another gorgeous motion-capture performance and the film looks fantastic, much of the film is spent in this dreary backdrop that I didn’t really buy into. It felt a bit out of character for Caesar to leave his people and turn his head toward revenge, and then when the movie tries to turn him into a Christ figure in a military capture sequence in the second act, it feels heavy-handed. The action is great, and this has been a really good trilogy, but I just had way more problems with this movie than I expected. Woody Harrelson is a great addition, as is the human introduction of Nova (Amiah Miller as a mute girl who joins the apes), so it’s not as if the new additions to the series are all problematic, but I think that the movie does overestimate its grandeur and ability to be epic. Instead, it feels like a movie that overreaches slightly and ends up a great-looking mess. One of the things that made John Wick so special three years ago was its ability to tell its story primarily through its action pieces. Atomic Blonde is helmed by one of the co-directors on John Wick, so the constant comparisons are not completely unearned. Like with John Wick, this film ends up with amazing cinematography and choreography, but by taking on a more complicated storyline, suffers in some of the execution. The result is a movie that’s absolutely worth the price of admission, but still has its problems. Charlize Theron plays Lorraine, an MI6 agent dispatched to Berlin after the assassination of a separate MI6 agent, who was after “The List,” a microfilm print-out containing a list of a ton of Cold War double agents given by a Russian politician (Eddie Marsan). While that assassin may not disclose the information directly to Russian leadership (Roland Moller as ‘Aleksander’), Lorraine must traverse the difficult territory in Berlin, including a French agent (Sofia Boutella) fresh on her tail and a disapproving U.S. agent (John Goodman), and make contact with the Allied forces’ main contact (James McAvoy), for her to gather information on finding “The List” and exposing any double agents affected by it. The film’s greatest achievement is its production, wonderfully mixing two color palettes of a slate grey when outside in dreary Berlin with a colorful, 80’s-centric hotel when inside. In addition, we get a good soundtrack with upbeat music that backs the intensity of the action scenes. It has its sense of fun and spy-movie intrigue that carry us consistently through the plot, and the production only adds to the sense of fun. The action choreography is as good as ever, and the performances and dedication from actors like Charlize Theron and James McAvoy are definitely worth it. The one problem is that the script doesn’t pull of the intrigue and betrayals that are intrinsic to this story with as much as grace as one would hope. When certain characters end up being triple agents, not just double agents, the third act really flies off of the rails, even through it remains fun and has great action. You’ll see what I mean when you see the movie. It’s got its good points, but the end will definitely lose some of the viewers. The comedy of the year so far is The Big Sick, a truthful story about how real-life comedian Kumail Nanjiani met his wife. It’s dramatic, it’s romantic, it features a ton of other good comedians, but most of all, it’s a movie with a real heart and great characters to carry it. Judd Apatow made a good call in ensuring this movie got made, and even made a good call casting relative unknown director Michael Showalter, who has had some success in television but didn’t really break into the movie industry until his almost-hit Hello, My Name is Doris came out recently. It’s also a gamble to use Kumail Nanjiani as a leading man in himself, who hasn’t had a ton of film acting exposure yet. The story is about a struggling comedian (Nanjiani) who meets up with a girl at one of the venues he recently gigged at. That girl is Zoe Kazan’s Emily, and they, against their better judgment, start a romance together. Things go relatively South after some time, but he is the first person called when she goes into a coma for unknown medical reasons. Over the course of the next few weeks, unsure if she’ll ever wake, Kumail begins bonding with her parents (Holly Hunter and Ray Romano). The movie has two other interesting topics: that of progressing in a relationship while one party is unconscious for it (realistically, you will be the same person to them when they wake up), and that of a cultural clash between his traditional Pakistani family and his American upbringing. It’s a lo-fi indie film, the kind that puts your antennas up about being one of the pretentious critics’ circle-jerks at Sundance, but in reality, this movie is very true to real life and features real emotions with real stakes. The fact that it was based on a true story definitely helps, but there’s such a sense of realism to all of the characters that they even tackle cultural appropriation rather easily. Instead of being this movie with a liberal slant (especially when it’s backed by all comedians), it stayed true to real life and approached these difficult topics honestly. I laughed through the whole thing and really bought the chemistry between the actors. Kumail Nanjiani does a great job taking over the lead role in a feature film, and Ray Romano is also a great presence in the background after disappearing for a few years. This is a nice underground treat that got some seriously deserved attention. 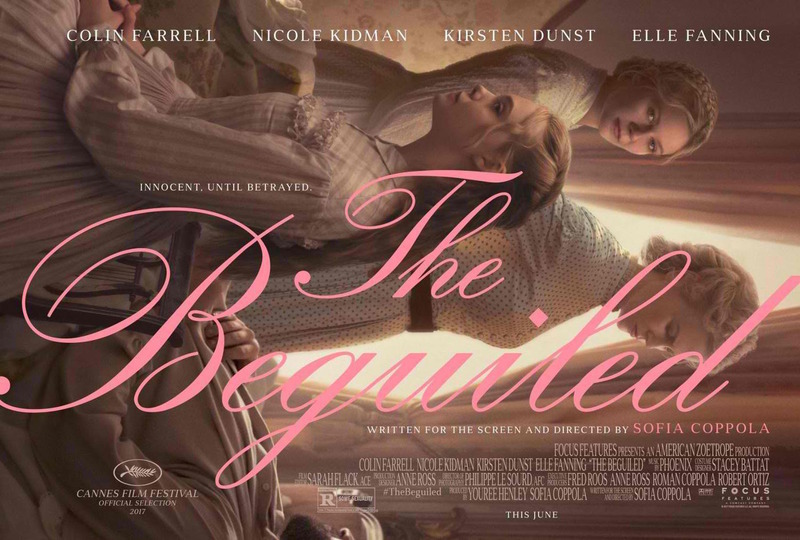 Sofia Coppola has directed a taut thriller that puts us directly into the 1800s Civil War era with its costumes and backdrop. Although the movie is a bit narratively fractured, and doesn’t quite have the level of suspense you’d want after watching the trailer, it’s still a very well-acted film with its fair share of good qualities. Colin Farrell plays Crp. John McBurney who defects from the Union Army after being shot and is discovered in the woods by a young girl named Amy (Oona Laurence). She brings him back to her school for women, run by the ferocious Miss Martha (Nicole Kidman) and her religious assistant Edwina (Kirsten Dunst). He is instantly met with odd attitudes for being the only man these women have seen in months, especially from the resident teenager Alicia (Elle Fanning). As the competition around him increases, so does the violence. It’s no secret that Coppola is a good director, and she has made two of the best films of recent memory in The Virgin Suicides and Lost in Translation, but has followed those up with a relatively cold streak of average films. She always has good costumes and good atmosphere, and that is completely accounted for here, but the narrative just doesn’t jump off the page in the way that you’d want it to. All of the performances are good, especially in the emotional Dunst and always rising Fanning, but watching it, I couldn’t help but feel that something was missing. I think that the movie isn’t violent enough to be the terrifying thriller it wants to be, but it isn’t intriguing enough to be a true mystery. Outside of wondering what Farrell’s John’s true motivations are, the movie is mostly devoid of the suspense it wants to badly. The performances and costume design are good enough to make up for these faults, however. This is a movie worth a rental.